Are you in need of swimming pool leak repair? Triangle Pool Service of Largo, St Petersburg, and Clearwater can have you back to enjoying instead of worrying about your pool in no time. Many people ask us in the summer whether the loss of water they experience in their pool is just evaporation or if they should be worried about a leak. Any time you have this same question we have a technique that will help you determine where the water is going. Take a 5 gallon bucket and fill it up about to within an inch from its top. Then place the bucket on a step where the bucket is more or less submerged put not floating away. If it wants to float then you may need to weight it down with a brick or other dense object. Once the bucket is in the pool, mark the water level on both the inside and outside of the bucket. After 24 hours, if both water levels have dropped the same amount, then your pool is fine and evaporation is your culprit. If the water level dropped more on the outside than the inside call us for quality pool service. Searching for Swimming Pool Leak Repair? Our team of qualified pool professionals can take care of any leak issues you may have with your pool. We use many techniques to locate and determine the severity of the leak. There are many locations on a pool that are susceptible to leaks over time. Sometimes there are spots in the pool itself that allow a water to escape. In some instances, the lines that circulate the water in your pool fail. We offer professional swimming pool leak repair service. We thoroughly test the lines to ensure they still handle the same amount of pressure that they were designed for when installed. If there is an indication of any drop in pressure, we will quickly find the source and stop it. Often times, the surface of your pool can wear down and allow water to pass through. Or seams where returns, drains, and lights are located become problematic. This type of leak can quickly become a big problem that has potential of weakening the structural integrity of the entire pool. Our quality swimming pool leak repair services can easily locate where this leak is in the pool. Our methods may differ depending on the type of pool. For vinyl, we can employ the use of electric current and an advanced sensor. The sensor’s purpose is to locate where electric current is passing on to ground. The smallest of holes in vinyl allows electricity to run to ground. Once we locate it then we can begin a simple patch repair. Other in-ground pools can be a little trickier and involve the use of a professional diver and small amounts of special dye. Using the dye, the dive will look for areas that cause the dye to run to them. Once they have been located, we use special composite patching materials that set under water to seal up any bad spots on the pool surface or reseal any problematic areas like drains and lights. 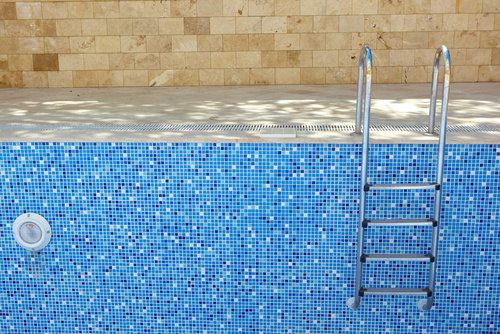 No matter what type of pool and where the leak is, our professional swimming pool leak repair service will take care of it. In extreme cases, the surface of a pool is just too old and shows many signs of wearing due to age. The surface of in ground pools, while durable, does not last forever. Depending on use, acidity levels, algae bloom problems, and material these surfaces break down over the years. If you can visibly see flaking in a lot of areas then this will lead to leak problems. Our swimming pool leak repair team is trained to analyze your pool surface and determine its integrity. If it appears that it may be near its life expectancy then we may suggest you have it resurfaced. In addition to fixing any pool problems, we offer many pool services including maintenance that will keep your pool clear and inviting for years to come. So give Triangle Pool a call today at (727) 531-0473 to find out about all of our wonderful pool services in Largo, Clearwater, and St Petersburg, Florida.